I don't know about you but this is my way of eating naan. It was Chinese New Year eve and we went to Curry House for breakfast. I was craving for cheese naan that morning so I order a piece for sharing. Wish for more cheese on top though. And we also had this nice curry lamb. Their curry lamb is good, we always order it when we done here. This is how I enjoy my cheese naan. Tear a piece of the naan, add a piece of lamb or potato to it. Roll or fold the naan and pop into the mouth. Yes, my way of eating naan. I like to eat mutton curry. 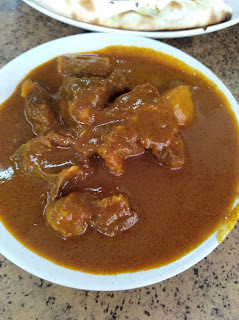 I will just put a piece of mutton into my mouth, add a piece of mutton and some curry into my mouth and mixed them inside all using utensils, hahahaha! lolx! Not a fan of Curry House here, not very friendly people, generally expensive and quality control not too good. They are opening another branch, the corner coffee shop beside RH HOtel! Eh, I do that too! LOL! 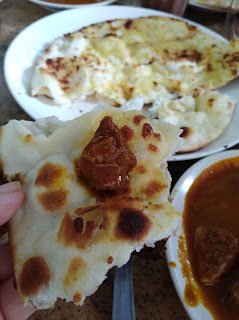 I love naan too.. only yesterday I went for Indian food, capati and puri with sardin and chicken curry. I usually order garlic or cheese naan. Mutton curry is hubby's favourite. 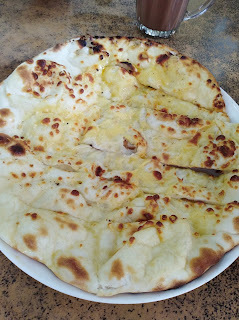 I love to eat Naan when they are still hot with crispy sides! I would dip them into any spicy curry too. Yums!